Increased temperature and CO2 levels are considered key drivers of coral reef degradation. However, individual assessments of ecological responses (calcification) to these stressors are often contradicting. To detect underlying drivers of heterogeneity in coral calcification responses, we developed a procedure for the inclusion of stress–effect relationships in ecological meta‐analyses. We applied this technique to a dataset of 294 empirical observations from 62 peer‐reviewed publications testing individual and combined effects of elevated temperature and pCO2 on coral calcification. 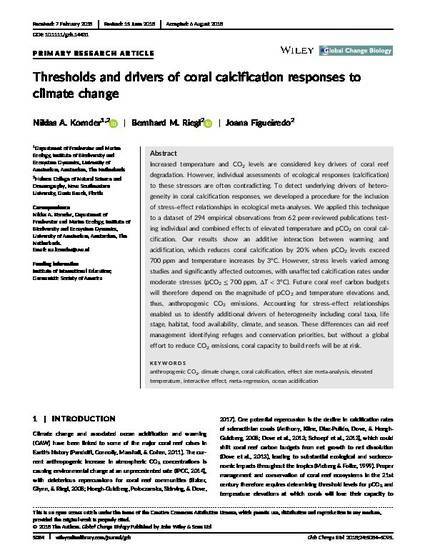 Our results show an additive interaction between warming and acidification, which reduces coral calcification by 20% when pCO2 levels exceed 700 ppm and temperature increases by 3°C. However, stress levels varied among studies and significantly affected outcomes, with unaffected calcification rates under moderate stresses (pCO2 ≤ 700 ppm, ΔT < 3°C). Future coral reef carbon budgets will therefore depend on the magnitude of pCO2 and temperature elevations and, thus, anthropogenic CO2 emissions. Accounting for stress–effect relationships enabled us to identify additional drivers of heterogeneity including coral taxa, life stage, habitat, food availability, climate, and season. These differences can aid reef management identifying refuges and conservation priorities, but without a global effort to reduce CO2 emissions, coral capacity to build reefs will be at risk.